simpleTON II, Software Filter from whiteLABEL. 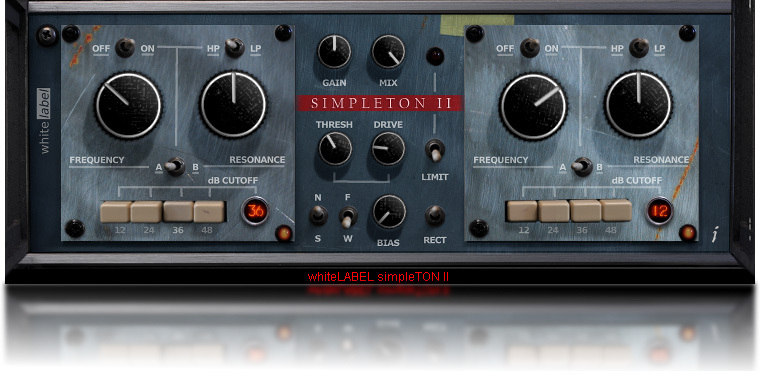 WhiteLABEL released the second version of its SimpleTON dual filter distorsion plugin for Windows. SimpleTON II offer several new features, including 8 poles per filter and huge amounts of resonance on-tap, the ability to switch between high-pass and low-pass for each filter and an A/B mode switch for a different flavour. The distortion section has also received a big boost with the addition of a rectifier, a bias knob and a two new distortion algorithms ripped from the bleeding hearts of bolsteriser revs (C) & (D) and re-engineered into waveshapers. The algorithms can be switched between pre or post filter 2 in order to chose between original and simpleTON II models. 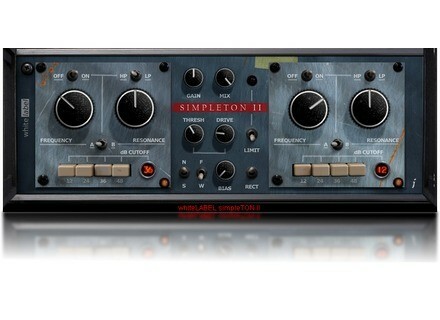 SimpleTON II offers a new bigger and clearer graphic interface, with hints for all the controls and a double-click reset function on relevant knobs as well as direct text input of both frequency and resonance. The LED on each filter respond to its input, and the limiter LED shows the depth of cut. SimpleTON II is available for download from www.roughdiamondproductions.com with a special launching price of £10 until March 31st (regular price is £15). Users of the first version can upgrade for half price. You can download a demo version (mono, without MIDI nor automation). Ueberschall launches Indie Rock 2 sound library Ueberschall introduces the second volume of its Indie Rock sound library, with more than 1200 samples and 10 construction kits. The UAD Software v6.5 is available Universal Audio announces the availability of the UAD Software v6.5 update, which brings new processings and the Softube amps. Special offer and AAX beta at McDSP McDSP lowers the price of its Emerald Pack plugin bunde and launches AAX beta versions for 2 more plugins.